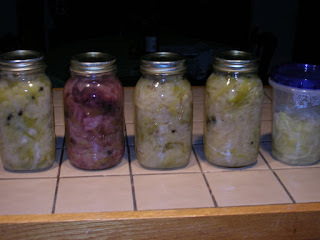 In another baby-step towards greater self-sufficiency, I've started fermenting my own sauerkraut. This was a true labor of love, in which I not only sliced off the tip of my finger while chopping, but also pressed the patience of my girlfriend by storing two gallons of fermenting cabbage under the sink. But, four weeks later, I have tangy, robustly zippy tasting sauerkraut. So there's two schools of thoughts on sauerkraut: canned and raw. It seems like people who eat a lot of sauerkraut sporadically through the year can it, while those who eat a little bit all the time keep it raw. The big difference is the bacteria. Sauerkraut exists by the kindness of beneficial bacteria that can survive in an incredibly salty environment (while most harmful bacteria are killed in by the salt drying out their little cellular membranes). It breaks down the tough cabbage and give sauerkraut its infamous tang, whileacting as the dominant life form on the cabbage and keeping harmful bacteria at bay. And eating sauerkraut raw makes sure these bacteria are alive when they go into your tummy, just like those pricey Live-and-Active-Culture yogurts. If you can it in a boiling water bath, it's still great and an important source of Vitamin C during the winter when you and your agricultural-society-era peasant farmer friends don't have any fruit crops growing (or if you were a sailor fighting scurvy). But, in the process of canning those beneficial bacteria are cooked till they're pasteurized and dead. Is there a big health benefit? Maybe. My office has been a Petri dish for the past two weeks now of colds and flu, but I've been feeling very healthy, munching on the sauerkraut as it aged along. Or it could be that I've been drinking homemade beer, which actually is a good source of B-vitamins (just short of drinking a packet of brewer's yeast mixed into water, or eating marmite..yuck). Or maybe because I exercise and don't smoke. Who knows. Maybe I'll be sick tomorrow. Anyway, back to the topic. So I did both. Canned some, kept some raw, and save a good amount of raw kraut juice to kick-start my next batch. What's fun is adding the different ingredients to each mason jar to mellow and meld together in the jar. I have one jar with juniper berries, one with carraway, one with garlic, black pepper, carraway, and juniper, and the last one (the purple one) has a good handful of dried wild blueberries. It might sound odd, but apparently the German's would cook their sauerkraut with Lingonberries to serve with venison. Do blueberries taste like lingonberries? Not really. But that's all I had. The next batch I'd like to try a jerked kraut with allspice, scallions, lime zest, and chilies. I think it would be great with some spicy braised chicken thighs. But I suppose I should eat these four jars first.